Welcome to our Mini- Unit on how to be a clear writer. For this non-fiction unit we will be learning to write instructions. Our inspiration is the book "The Complete Worst Case Scenarion Handbook." A pithy series of books which use clear step-by-step instructions to help teach the reader a very important skill. ​Here is a link to how to buy a copy if you want to! 1. Ask for two volunteers. A student to draw something on the board, another student to explain to them what to draw. - Student who is explaining can be given an object to explain to the other person, or the person explaining can quickly sketch something and then explain. -After, see if both came up with the same object. 2. Do a quick and easy test - one that requires students to follow directions. Discuss importance of following instructions when done. 3. Show a small video clip that shows the importance of being clear and being understood. 4. Mr. Fitton Demo - student volunteer will come up. Mr. Fitton will ask them to give him instructions on how to Make a Peanut Butter and Jam Sandwich. Or if students have seen that before, how to put on a pair of pants and a jacket. The person explaining is not allowed to look at the teacher. The point of this activity is to show how language needs to be clear in order to be effective. 5. 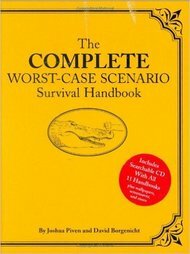 Mr. Fitton will distribute some exmples of the worst case scenario handbook. Students will present them to others. The point is just to show how a mix of visuals and writing is best for instructinos. We could also make youtube videos if students want. 6. Distribute Handout of the assignment. Students now get an opportunity to write out their own instructions, with photos.